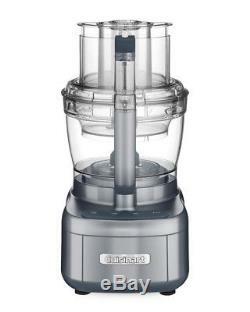 Cuisinart Elemental 13-Cup Food Processor with Dicing. 13 cup large work bowl and 4-cup smaller, inner nested work bowl. Advantage system -- seals bowl and locks blade. Supreme wide mouth feed tube with small, medium, and large pushers. Stainless steel blades and disc. 10mm dicing disc with grid plus cleaning tool. Chopping/mixing blade with patented blade lock system, including dough blade and small and large S-blades. High/low/off/pulse with illuminating LED lights electronic touchpad controls. This product is manufactured in compliance with U. If product is to be used outside of the U. Use only with the appropriate outlet adapter and voltage converter for your country. Do not plug into an electrical outlet higher than 110-120V as this could result in fire and/or injury. The item "Cuisinart Elemental 13-Cup Food Processor With Dicing" is in sale since Wednesday, September 12, 2018. This item is in the category "Home & Garden\Kitchen, Dining & Bar\Small Kitchen Appliances\Fondue Sets". The seller is "la_via" and is located in Shepherdsville, Kentucky. This item can be shipped to United States, Canada, United Kingdom, Denmark, Romania, Slovakia, Bulgaria, Czech republic, Finland, Hungary, Latvia, Lithuania, Malta, Estonia, Australia, Greece, Portugal, Cyprus, Slovenia, Japan, China, Sweden, South Korea, Indonesia, Taiwan, South africa, Thailand, Belgium, France, Hong Kong, Ireland, Netherlands, Poland, Spain, Italy, Germany, Austria, Israel, Mexico, New Zealand, Philippines, Singapore, Switzerland, Norway, Saudi arabia, Ukraine, United arab emirates, Qatar, Kuwait, Bahrain, Croatia, Malaysia, Brazil, Chile, Colombia, Costa rica, Dominican republic, Panama, Trinidad and tobago, Guatemala, El salvador, Honduras, Jamaica.